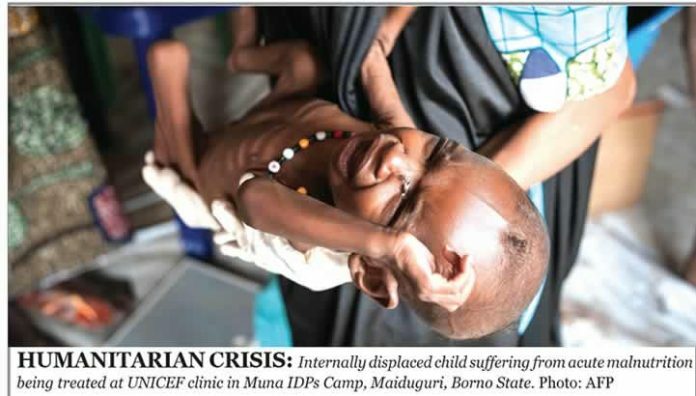 The Federal Government has declared a nutritional emergency in Borno State following the increase in the number of the Internally Displaced Person camps in the state. The Federal Government also mobilised a rapid response team to coordinate efforts to ameliorate the situation. The Senior Special Assistant to the Vice-President on Media and Publicity, Mr. Laolu Akande, disclosed this in a statement on Friday. Akande said in its determination to bring relief to the persons recently rescued from Boko Haram captives and to ensure their well-being in the IDP camps, the Federal Government conducted an on-the spot assessment at the camp in Bama. He said the team was led by the Special Adviser to the President on Social Investments, Mrs. Maryam Uwais. Akande quoted Uwais as restating government’s commitment to bringing relief to the rescued Boko Haram captives currently hosted in the IDP camp in Bama. “We are here to see for ourselves the situation on the ground here,” Uwais was quoted as saying. Describing the development as “a crisis situation,” Uwais assured them that the Federal Government would work with the state government, international community, local partners and civil society groups to ensure that all the needs of the IDPs were met. The Senior Special Assistant to the President on IDPs, Dr. Mariam Masha, assured them that alongside the humanitarian work, the federal and state governments were also focusing on the longer-term programme to ensure that the reconstruction and resettlement was effectively hastened to enable the IDPs to return to their homes. She added that as the military continues its task of liberating hitherto isolated communities from the grip of Boko Haram, the scale of the humanitarian crisis was certain to increase. She therefore called for increased support from all partners and stakeholders. The delegation, which included senior officials of the Borno State Government, officials of the National Emergency Management Agency, the State Emergency Management Agency and representatives from the United Nations, was taken around the camp home to 25,000 adults and children, by the Brigade Commander, 21 Armoured Brigade, Bama, Col. Adamu Laka.